(L-R) TÜV SÜD's Ms. Ma. Kristel Oriarte and Mr. Reynaldo Ong, Jr. award the ISO certificates to Mapúa University President and Chief Executive Officer Dr. Reynaldo B. Vea, Executive Vice President (VP) for Academic Affairs Dr. Bonifacio T. Doma, Jr., Senior VP for Operations Atty. Maria Eloisa R. Gan, and Executive VP for Finance and Chief Financial Officer Dr. Ruth C. Francisco. 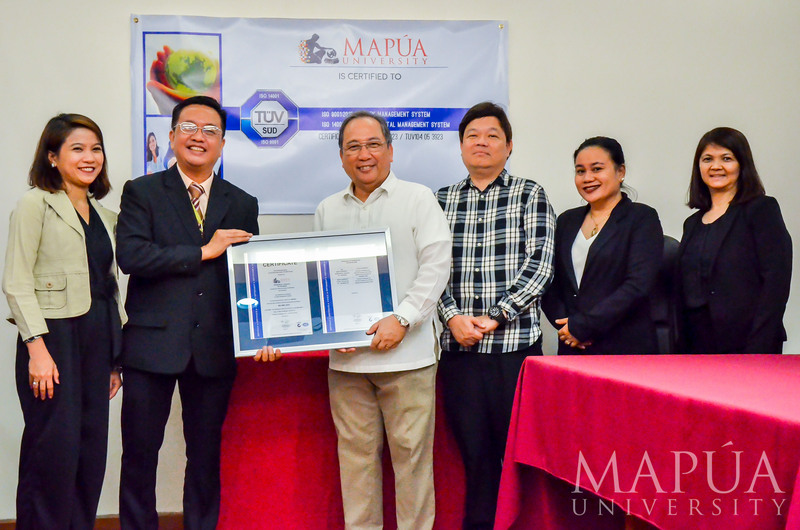 Mapúa University was recently granted an ISO certification on environmental management systems, adding another achievement to the University’s growing list of recognitions and accreditations. Coinciding with this, the University also recently upgraded its ISO certification on quality management systems from 9001:2008 to 9001:2015. The environmental management systems certification, or ISO 14001:2015, is a testament to Mapúa’s dedication to reducing its carbon footprint. In addition to this, the quality management systems certification, a recognition acquired in September 2014 and was upgraded recently to ISO 9001:2015, demonstrates Mapúa’s processes and management systems adhere to international standards. “When we say that a desired outcome of our academic programs is for our students to be able to understand the environmental implications of solutions to problems, we want to show that we mean it by example with our own concern for the environment,” says Dr. Reynaldo B. Vea, president and chief executive officer of Mapúa University. The compliance with the ISO 9001:2015 further strengthens the systems involved in the implementation of outcomes-based education (OBE). This is because the attainment of academic program outcomes and the continuous improvement of the levels of such attainment are dependent on Mapúa’s quality management systems.